This Tribunal was part of the US and other Allied governments efforts to determine the responsibility for WWII and bring to account those who committed crimes against humanity. Between 1945 and 1948 several of these trials were held in the Palace of Justice in the German city of Nuremberg, hence its name. 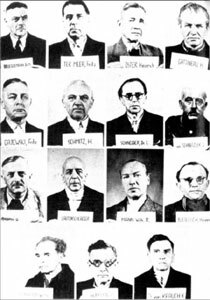 The Tribunal consisted of a series of 13 trials, the first one against the “main war criminals” was entitled “The USA, France, United Kingdom and USSR v. Hermann Goering et al.” This trial took place between 1945 and 1946 and ended with long prison sentences or the death penalty for most of the perpetrators. Interestingly, it was this first trial against the political and military figureheads of the Nazi regime that has been generally portrayed as “The Nuremberg Tribunal.” This is historically inaccurate. Moreover, it has deflected attention away from the real “war criminals” who, with their economic power, had financed the rise of the Nazis and the preparation for WWII. 1943 plenipotentiary for Italy of the Reich Minister for armaments and war production, military economist chief industrialist responsible for Auschwitz. Starting in 1954 chairman, deputy chairmen and member of the boards of: Chemie Grünenthal, Pintsch Bamag AG, Knoll AG, Feldmühle Papier- und Zellstoffwerke, Telefunken GmbH, Grünzweig & Hartmann, Internationale Galalithgesellschaft, Berliner Handelsgesellschaft, Süddeutsche Kalkstickstoffwerke, Vereinigte Industrieunternehmungen (VIAG) with its subsidiaries Scholven-Chemie and Phenol-Chemie as an advisor to F. K. Flick und of the US Industrialist J.P. Grace is entangled in the early eighties in the "Flick scandal"
SS Obersturmbannführer, military industrial leader, awarded the "friend of the Reich leader SS" cross. 1952 supervisory board member of Ruhr-Chemie and Kohle-Öl-Chemie among others. 1955 supervisory board member of the "new" Farbwerke Hoechst. In the same year elevated to supervisory board chairman elect – Karl Winnacker said "in the meantime the liquidation conclusion law had been issued and freed us from all discriminating regulations. So we could add Friedrich Jaehne, chief engineer of the old IG, to the supervisory board. He presided over this committee until 1963. In 1945 none of us would have thought that the two of us would be able to co-operate at the head of our company ". 1952 honorary professor of the University of Heidelberg , Dr. rer. RK h.c. the University of Tübingen , 1953 Dr. Ing. E.h. of the TH Munich, 1955 Distinguished Service Cross of the Federal Republic of Germany, Bayer service medal, 1960 Dr. rer. pole h.c. the University of Mannheim, honorary senator of the Universities of Mainz, Karlsruhe and Tübingen, honorary citizen of the University of Stuttgart, honoury citizen of the city of Ludwigshafen, 1967 Schiller prize of the city of Mannheim, president of the federation of the chemical industry, vice-president of the Max-Planck company, the company of German chemists.